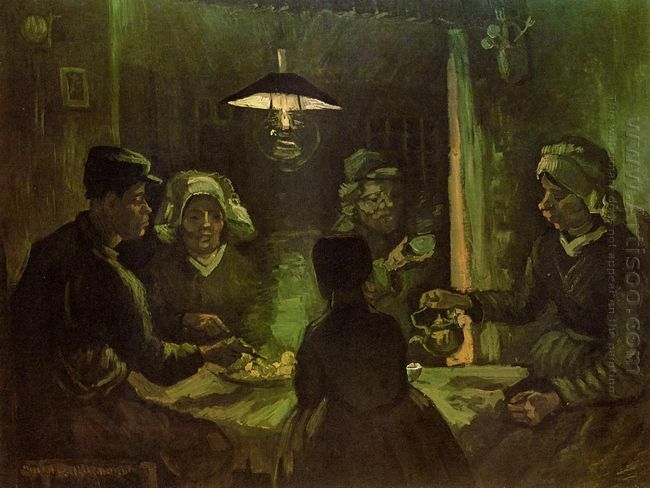 The potato eaters is the oil painting created by Vincent Van Gogh, the Dutch painter of Post-impressionism in 1885. By the end of 1883, Van Gogh went back to Nuenen, a church where his father worked for. During the two years in Nuenen, Van Gogh were trying his best to practicing pencil sketch. After completing a lot of pencil sketching, Van Gogh created his first famous painting (the so-called famous is baesd on comment of the later generations and Van Gogh was an unemployed youth at that time)--the potato eaters. This picture and many other paintings at that time were influenced by realism painting style in Holland, which is full of country flavor and dark prospect. 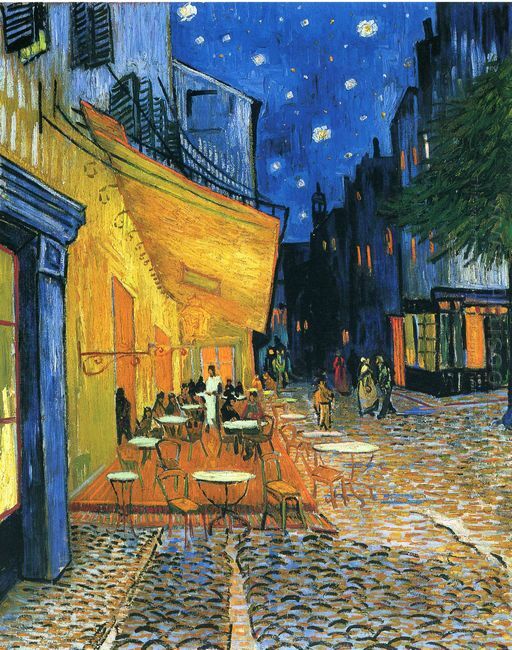 This painting also shows us the strong countryman spirit of Van Gogh; he wanted to be a country painter. There are two reasons, the first one is that Van Gogh was influenced by his "spiritual master" --Millet. But the more important one is that his strong longing for the countryside in his deep heart, the respect to the farmers and the appreciation to the honest laborers. Van Gogh has much deep feelings for the poor life of the laborers because he came to know the lower class in his earlier life. The potato eater is a representative of his works during this period. In this painting, the earthy and honest peasant family are sitting around a small table, where a light hanging over. This becomes the center of the whole picture. The dim light sheds on the farmer's withered faces and makes them really outstanding. The low roof makes the room really crowded. The dark tone makes the painting strongly depressing. The structure of the picture is simple and the characters here are really innocent. The painter describes the faces full of wrinkles and skinny bodies of the characters with his coarse and powerful painting skills. The background color of this picture is shallow, in order to foil the image of the characters. Van Gogh himself said this picture was "the birth of the expressionism". He said, "I don't want to make the people in my paintings real. The real painters drawing the objects do not absolutely paint them as what they exactly look like, but according to the painter's feelings. I really admire the characters drawn by Michelangelo, although their legs are too long and their hips are too big." Some people criticized the images in this picture are not correct. Van Gogh said, "If my characters are exactly the same as they are, I will be really despaired, I want to make these inaccurate, reshape and change the fact. Yes, they are not real, you can say that, but they are actually much more realistic than that." 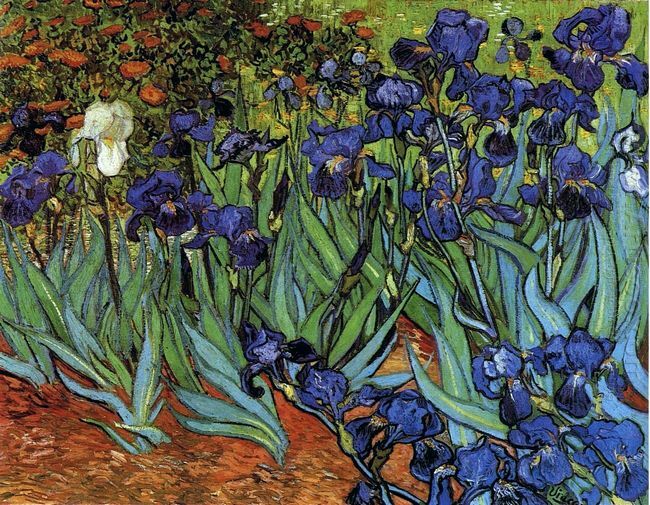 Vincent Van Gogh usually uses exaggerated way in colors to highlight the objects. And his tone is usually dark; this makes people feel strongly repressed. The strongly contract between the pale light and the dark light-green tone in the picture gives us a grave atmosphere and makes the characters extremely outstanding. The steam comes from the plate with the potatoes makes this scene so real in the peasants' family. This painting strongly reflects the social conscience of Van Gogh. He chose the farmers as the painting characters mainly because he found himself had the same feeling in the poor peasants both in spirit and emotion. He wrote in the letter sent to his brother like this, "I want to emphasize that the people eating potatoes under the light are digging the earth with the hands reaching for the potatoes. Therefor, this painting is describing the laborers and how they get their food honestly." 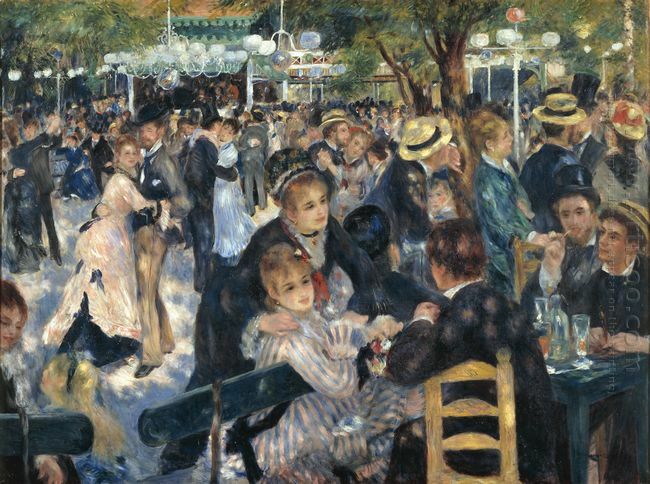 Ten years before Renoir was born, the first steam-train had started in France, then the constructions of the .. 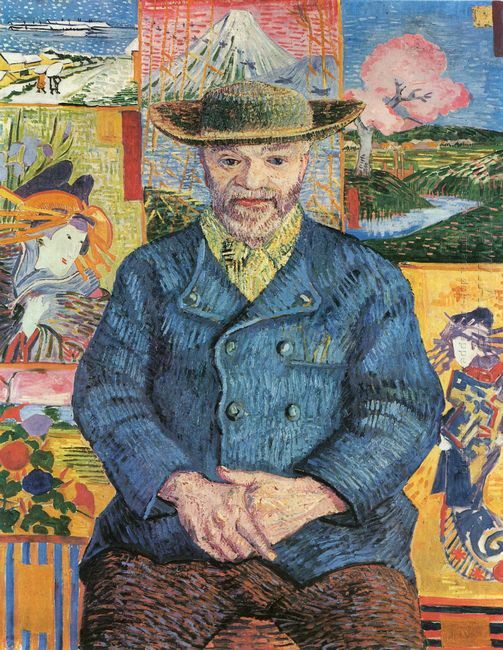 If list a person who had the most great impacts on Van Gogh, it can probably say Gauguin .. 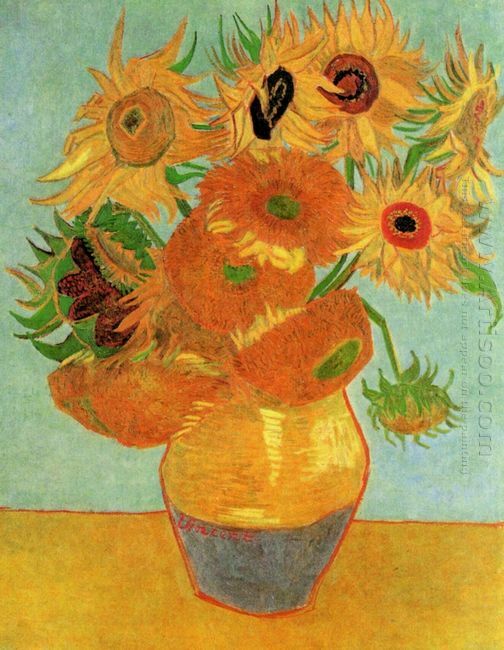 Preserved in the British National Gallery, Sunflower is one of the most attractive oil paintings to viewers. Its ..
Père Tanguy was created between 1887 and 1888. It is now collected in Rodin Art Gallery in Paris. .. This entry was posted in Impressionism Painting, Oil Painting and tagged farmers' lfe, potato eater, social situation, Vincent van Gogh. Bookmark the permalink.